On 11 June 2014 I visited Lidingö Kyrka to commemorate the 100th anniversary of Gerald Mohr’s birth in New York. The day was warm and sunny and I was joined by my travelling companion, Sue, together with Sven Erick Alm, Gerald’s step-nephew, and Joachim Bjork, the journalist who ran articles about my visits in the Lidingö Tidning newspaper. The day before I had visited the gravestone and done the necessary housekeeping, which included cutting back the ever-encroaching vine of ivy and cleaning the flower cup, removing the old flowers which had endured two winters! I then placed the new card and flowers on the gravestone. I thanked individually Sven Erick, Joachim and Sue for their help and support with my research of Gerald’s time in Stockholm. We then had an alfresco lunch at a local eaterie of Joachim’s knowledge and choice before going our separate ways for another year. 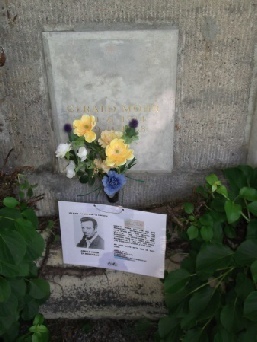 I returned alone to the gravestone the day before I travelled home to have a little private time there. It really is a beautiful place.